So you know that phrase that says Moshiach will come when all Jews keep Shabbat twice (or, according to some traditions, thrice) in a row? Yeah. I’m pretty sure I’m the one keeping Moschiach from coming. I am not shomer Shabbat. I never have been, and I don’t think I ever will be. I haven’t been shomer Shabbat in the past because I grew up as a non-Jew doing non-Shabbat-y things on Shabbat. I’m pretty sure Saturday morning cartoons are quintessentially American like apple pie and Twinkies. I’m not shomer Shabbat because I do not currently live in my own place. I can’t very well ask my parents to please forget that very important game on Saturday. I will probably not be shomer Shabbat in the future because The Boy will, G-d willing, be the co-occupant of my future abode and he’s more of a wine, candles…and movie kind of Shabbat guy. It’s not that I don’t want to. It’s that I’m lazy. I admit it. I don’t live in a Jewish area (anyone wonder why Orthodoxy’s going strong? This, more than any other thing, is it, IMNSHO.). I don’t have a Jewish group of people around me 24/7. No one close by for Shabbat or Yom Tov. Getting to shul is an ordeal. Reminding everyone to please not touch the light switches (scotch tape is your friend?) and even if you think this is stupid, it’s not to me, so please, for the love of all that is Holy, just do me this favor for 25 hours. Here I was. Browsing the list of Birthright Trip Organizers back in September. Wowza. I wonder what it’s like to hear the Shabbat siren. It may or may not have been the primary decision-factor. Fast forward a few months and I’m actually IN Eretz Israel. While everyone else was clapping when the plane landed, I was busy saying my Shecheyanu. Not every day that you get to *BE* in Israel. We are up in the Golan Heights for a few days (which I will talk about later). Then we drove to Tel Aviv. I met The Boy’s Tel Aviv-ian cousin in a bar for a few hours. I slept for four hours. I get on the bus. I am taken to Israel’s Hall of Independence. I am blown away. I am shuffled to the bus again. Matisyahu’s Jerusalem comes on the speakers. There is a clock as you enter the city limits. It says the time Shabbat starts and ends. This is mind blowing. We are dropped off at Marzipan Bakery in the Shuk. I am immediately hungry at the sight of delicious challah. You can get it from the size of your fist to the size of your leg. No joke. They have the world’s best rugelach. No, trust me on this. You may make great ones that are gone fifteen minutes after coming out of the oven. Your Bubbe may have won countless awards and be in some cookbooks. But these are the world’s best. I didn’t believe the hype. I was a skeptic. I was proven wrong. The chocolate and cinnamon come out on sheets as big as a kitchen table lined with parchment paper and just enough oil to prevent sticking. They are good even days later, but of course are best eaten right out of the steaming bag. 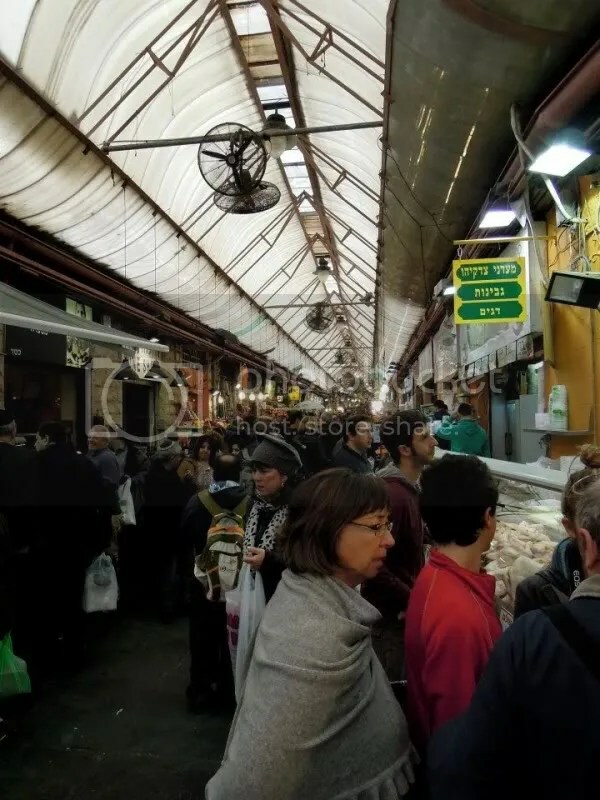 I then prowl the Shuk for two hours. Turkish baklava. Kosher butchers galore. Freshly-squeezed pomegranate juice. Judaica stands so I can find my 10 shekalim “Secret Santa” gift. (Yes, my Aish/OU sponsored Birthright trip did in fact include a Secret Santa gift that definitely made me give them the raised eyebrow.) I bought a really nice “poh” dreidle for myself, and a 10 shekalim one for my Secret Santa partner. And more importantly, the pulsating urgency of Shabbat. It was everywhere in this crowded place. Then on the bus to our hotel in Bayit Vagan. Two hours to don religious attire. Apparently some of the female participants needed clarification on what an appropriate skirt was. The kippah-less men are presented with presents. We are transported to Jaffa Gate. We walk briefly through the Armenian Quarter before hurrying through the Jewish quarter to the Aish HaTorah center. The location is… enough to take your breath away. There’s no other way of describing the multi-tiered building perched on the courtyard overlooking the Kotel. We listen to a pre-Shabbat concert from a rabbi that studied at UCSB. His personality leads me to believe he would still fit in well with the student body of his alma mater. He also had the audience’s—all Aish/OU Birthright groups, plus a few of Aish’s own programs—men singing “Shabbat shalom, Shabbat, shabbat,” in a deep bass-y voice while the women sang, “Shabbes, Shabbes, Shabbes” in a more alto/soprano. It was annoyingly catchy and stuck with us as a motto for the remaining five days of the trip. They took the men up to the roof top while our group “mom” brought the women to light candles. We were running short on time, so we quickly laid out 22 sets of candles. She tried to set the kavana for the blessing by describing why this is our mitzvah, what it represents spiritually and symbolically. I strike my match and the tears flow. I am not even one year’s old Jewishly speaking. I am here in Jerusalem, watching the plaza fill with soldiers and Chassids and Dati and Chiloni, in Israel, because someone thought I was worthy enough to stand at the wall that we have prayed toward and for. For hundreds and hundreds of years. I don’t think I’ve ever felt more Jewish, more connected. It was spiritually overwhelming to consider the gravity of hundreds of Jews celebrating Shabbat at the wall. We light and walk to the wall, pushing gently forward. I appreciate that I tower over most women when I deliver the prayers I carried for my mom, my best friend, my best friend’s mom, and myself. I work them into the nooks. I back away, to the flag pole, and just watch. The energy. The people. I let it sink in. We walk to our dinner, uphill, in the cold, for an hour. Challah never tasted so good. Our rabbi asks each of us to offer a blessing for the group. I am the last. We walk uphill for two hours to our hotel. People no longer see the joy in Shabbat. I am upset that for the 20 totally secular kids on my trip, those with no religious connection to Judaism, that this is part of their Shabbat. It was miserably cold and we were already exhausted from lack of sleep. I didn’t want this to be 30% of their Shabbat experience. It wasn’t fair to Shabbat that the OU Welcome Center and the Old City are so far from the neighborhood where our rabbi’s parents lived. And we listen to our “group dad” speak about his career, which serves as an allegory for life. And we listen to the secular Israelis complain about the biased view of Israel being presented to us. And we do havdalah with bay leaves and Krembos. And I think I see Moschiach off in the distance, inching closer and closer. I usually avoid political discussions on this blog. I feel they can alienate some readers and are the quickest way to insert my mouth into my foot in the heat of passion. But, before the U.S. congress at this moment are two bills that I care so passionately about that I had to break my rule of thumb. So consider it more like a rule of pinky or something. SOPA and PIPA are two bills before the U.S. Congress. They seek to reduce the amount of copyright infringement that occurs on the internet. A laudable goal in my opinion–I think the people that create content should be rewarded for the efforts and innovation. But, granting a crazy-absurd amount of power to the entertainment industry, who suffers from ginormous amounts of infringement precisely because of their inability to understand the natural rhythms of the internet and their refusal to adapt to technology as it comes about, and to the DoJ, is NOT the way to do this. These bills would allow *anyone* who reads Mikvah Bound, *or any of the websites LINKED to this site*, to deduce that I am infringing on someone’s copyrighted content. How did they reach this conclusion? What is their proof that this is copyrighted material? Who cares. With this knowledge of Mikvah Bound’s copyright infringement, SOPA would allow them to contact WordPress, PayPal, Facebook, and Wikipedia to notify them of my infringement. I would have five days to submit my appeal of this notification to the Courts; alternatively, some kind soul at one of the legal teams of the sites mentioned above could decide to fight the fight for me in the courts. But, seriously, what is a corporation likely to do upon notification that Mikvah Bound is infringing: block access to my site as they would be required to do under this law to avoid legal fines and action OR kindly agree to fight my fight for me. Yeah, not going to happen! There is nothing to prevent Hollywood (or any other industry or agenda-driven agency) from attacking all sites they dislike or disagree with. These accusations do not have to be launched in a public setting, i.e. a court of law. There are no punishments for those who abuse this law’s vaguely worded language, either, should I unfairly accuse innocent websites of infringement. They’ve got those five days to defend themselves after all; it’s their own fault if the accused choose not to do so. So I am asking you, kind readers to contact your Congressmen (assuming you live in the US. Ameri-centrism ftw!). I am asking you to learn more about this bill and would its ramifications would truly be. I am asking you to consider blacking out your own site or posting your own banner until it is voted on, January 24th. Or rather, HOW to begin. How do I begin to describe 10 days that felt, in all honestly, like ten months? I heard from everyone before I left that I wouldn’t sleep on the trip, that that wasn’t the purpose of the trip, and that I could sleep when I got back. Yet sleep deprivation, jam-packed itineraries, foreign food, and airplane air will quickly run you down. And that’s without the spiritual and inter-personal exchanges going on. How do I answer my family and coworkers’ questions of how the trip was? My family cares about me, knew what this trip meant to me, and wants to know if it was everything I wanted. I want to be able to answer, but I’m still chewing on so many sites and questions that I can’t find a way to respond. For coworkers it’s harder. We generally get along and they were all excited to hear about my plans. But when they ask me how Israel was… they don’t understand how this trip isn’t like a week in Hawaii or Paris. Israel is different for Jews, even for totally secular, or totally disconnected Jews. So I throw out some details tailored to the coworker out of polite obligation and try to move on through the mountain of work I have on my desk. So for this blog, for the few readers that make a point of checking in…I’m still not at a place where I can begin to describe everything that I experienced. Yes, I will absolutely post later on about specific days or visits that hit me the hardest, that forced me to challenge my beliefs, or that served as strong confirmation and affirmation that resonated deep in my soul. There were moments when the Rabbi leader of our trip really spoke to me as a Jew with deep insights into Torah, humanity, and living in a secular world. There were other moments when I questioned my right to be on the trip. Now, days after, I feel myself drawn to the tension he brings to me life. I’m still not sure why, but I have a feeling I’m supposed to learn something from him. If I haven’t already (and just didn’t realize it…maybe it will come in the coming weeks), I am supposed to keep in touch with him for a reason. I wish I knew why. The madrachim were one of the most delightful couples I’ve ever met. The husband was a Disney animator. Listening to his journey, not only through his career, but also his Judaism, brought lots of questions and expectations (for myself) to mind. In the course of conversations, I learned that he spoke about why he cannot accept my conversion as valid to other trip mates, but he never treated me differently. And if I was your average Reform/Conservative convert, I never would have recognized his subtle, respectful way of handling the wine I brought for Shabbes. He’s a a Mensch. His wife was truly delightful, one of the best people I’ve ever had the pleasure of meeting. There is something about Orthodox women that make me feel like a failure as a human being. Not that they ever intend this, but sometimes it’s just hard to feel like you’ve ever done anything worthy in their presence. She is that awesome of a person and her children are so, so lucky to have her as a mother. The Israelis I met really forced me to question my “standards” for the term friend. How do you feel so attached to people after 10 days, while abroad, when it can take you weeks and weeks to open up back home? That is what I spent most of the flight home thinking about. I don’t know the answer. The tour guide made this trip. He put everything into showing us why he loves his country, and it was hard NOT to accept his infectious enthusiasm for this place. He was so capable of running around silly one moment and then deeply responding to one of your tough questions the next. Our guard entertained us with her beautiful voice, the sad tale of growing up in Southern Israel, and her mini-ulpanim. The Israeli soldiers loved showing us around and yet watched with awe as we explored their home for the first time. I remember laughing after we were given our time at the Kotel on Shabbat; one of them was so surprised and humbled that we cared about the Wall. Really? What must he think of American Jews? My trip mates were overwhelmingly frustrating with a few saving graces. Many had not travelled abroad. Many were quite JAP-y, sorry to say. A few quickly formed a “cool kids” clique that was hard to break through. I was so tired of them by the second day that I quickly turned to my iPod and journal. There is a girl from my city that I really connected with, a girl from another Southwestern state, and a guy from up in the Northwest. It’s kind of disheartening to realize that 40 randomly selected Jewish young adults… and you can’t stand 35 of them. One of the reasons I wanted to go on this trip was to connect culturally and people-y, beyond religion-ly to Judaism. I’m left with a lot of questions of why I have a hard time connecting to Jewish peers, and I do mean beyond the difficulties I have with my peers, period, introvert that I am. I’ve never felt my own country was inadequate before. Yes, the USA has disappointed me on many fronts. But it hit me like a thud on the third or fourth day, while travelling around Israel’s boondocks, that even in Podunk Israel, it was easier to be a Jew than in New York City or Los Angeles. Everything I saw had a hecksher on it. Every restaurant had a sink with a two handled bucket. Every door had a mezuzah. I heard mean shouting “Mincha, mincha!” in parking lots of gas stations. I will never find that in the US. I will always be the minority. And then I think of all the things I can have in the US that I will never have in Israel: no conscription. Ability to marry a non-Jew if I wanted. No PTSD. It may not be a fair trade-off, but it’s one I’m willing to make. I have no idea how asthmatic Israelis survive. I’m back, hacking up a lung, but alive and happy to have experienced what I did. I’m still not at a point where I can articulate what I experienced, exactly, but I’ll try to put it into words as the days pass. As awesome as Israel was and as much as I can’t wait to go back, nothing beats your own bed, clean laundry, mom’s cooking, and hugging The Boy.